There is a $9.00 US shipping fee per order. Additional charges may apply for overweight packages. This shipping charge will be added to the final total of your order. Please allow 2-4 weeks for delivery. 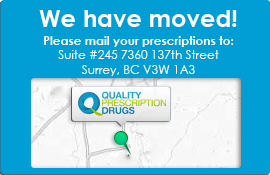 If you have any question, please feel free to call us at 1-877-244-0429, or email us at info@qualityprescriptiondrugs.com. One of our Customer Care Specialists will get back to you in a timely manner. Do you send packages internationally? Unfortunately, we presently do not ship products internationally. We only ship to the United States. Please allow 2-4 weeks for delivery into the United States. We currently do not ship any of our items to Canada. If your prescription order was damaged in shipping, please call us immediately at 1-877-244-0429. This ensures only the highest quality and safety Canadian prescription drugs are shipped directly out from the pharmacy to you. Therefore, we are unable to return or refund medications once they have been shipped from our Canadian pharmacy. All sales are final.